If you have no idea what “iTeaHAL” is, this sounds rather ominous… something’s hijacking my iTunes?! It also didn’t help that I noticed this soon after using my laptop (if only for about 30 seconds) on [“the worlds most hostile network”](http://defcon.org/html/defcon-15/dc-15-faq.html) at DEFCON 15. I thought perhaps this was some kind of trojan backdoor that was piggybacking off of iTunes Music Sharing or something. It turns out it’s nothing quite so evil. Google turned up nothing except other people also wondering what the hell iTeaHAL was. Then I tried finding files named iteahal: “find / -iname iteahal*” also turned up nothing. I knew those strings must be stored somewhere, so next up was a grepping of the entire drive: “grep -arsi iteahal /”. Apparently when an application loads audio plugins (like iTunes, iMovie, Skype, and other audio applications), it tries to load the iWow plugin, which detects whether or not it is iTunes, and spews all this debug information to the console. I had a great weekend in Las Vegas at [DEF CON 15](http://www.defcon.org/). Met lots of cool people, saw lots of interesting presentations, ate lots of good food, and spent way too much money doing it all. – The Church of WiFi’s “Wireless Extravaganza”, an overview of their current WiFi and Bluetooth projects. – Steve Dunker on police procedure. – H.D. Moore’s “Tactical Exploitation” (also the talk in which the Dateline reported was outed). – Jeff Moss on “CiscoGate”, the story of the Michael Lynn / Cisco / ISS / Black Hat debacle in 2006. – David Hulton’s “Faster PwninG Assured”, using FPGA’s to crack Bluetooth PINs and WinZip / Apple DMG encryption. – Johnnie Long on “No-Tech Hacking”. – Dan Kaminsky’s “Black Ops 2007”, various web vulnerabilities. – Zac Francken’s talk hacking access control readers like HID Prox cards. – Brett Neilson on modern radio scanning (which is inspiring me to get back into scanning). – David Gustin overview of “hardware hacking for software geeks”. [Joe Grand](http://www.grandideastudio.com/) one-upped himself with the DEF CON badges this year. Last year the badge was a PCB with two blinking LEDs. 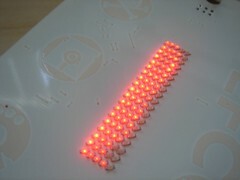 This year it has 95 LEDs that can display scrolling text or a P.O.V., and can be reprogrammed by the user using the two capacitive touch sensing buttons. 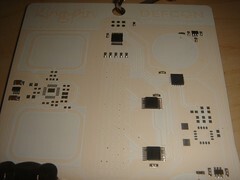 The PCB also has pads and traces for accelerometer and ZigBee wireless transceiver chips. 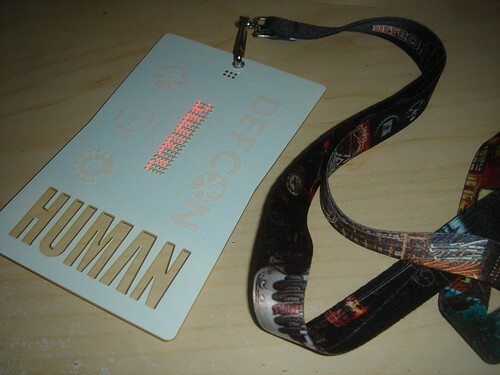 It would have been awesome if everyone’s badge already had them… imagine 6,000 DEF CON attendees’ badges wirelessly transmitting their accelerometer data. With a bunch of receivers placed around the conference hall, you could make some pretty neat maps. Oh well, there’s always next year!